Are Adam and Maria Baker Hannah’s Parents? Benjamin F. Church, Milwaukee pioneer builder and my third-great-grandfather, was the son of Caleb Church and Hannah Baker of Ulster County, New York, according to several sources. These include his brother Samuel’s biographical sketch in Commemorative biographical record of Ulster County, New York, containing biographical sketches of prominent and representative citizens, and of many of the early settled families, Part 2, and the genealogy book Descendants of Richard Church of Plymouth, Mass. You can a read a brief sketch of Caleb and Hannah on page 322 and a list of their children on page 323 of the Richard Church book. Samuel Church’s biographical sketch is also online. A recent viewing of Caleb’s will via Ancestry.com confirms the names of his and Hannah’s children. But there the Church and Baker families seem to stop. Some of Caleb’s descendants believed he is descended from Richard Church who married Elizabeth Warren, daughter of Richard Warren, a Mayflower passenger. But that is unconfirmed, so the family is in the “Unplaced Members of the Plymouth Family” in the Richard Church book, as explained on page 321. I have just hired a professional genealogist based in New England, who frequently visits Ulster County, to help discover more about Caleb Church who, son Samuel said, was born in Dutchess County. Ulster County is west across the Hudson River from Dutchess County, in the southeast corner of New York. The researcher will start with finding the full probate records for Caleb Church and for a Samuel Church who named Caleb his brother and co-executor of his will. While that is underway, I decided to research further the parents of Caleb’s wife Hannah Baker, who was a wife, mother to 10 children and a Quaker minister. A descendant of Phoebe Church, sister or half-sister to Caleb, recalled Hannah Baker’s parents as Adam and Maria Baker of Ulster County. Could I make the connection? Among those listed in the Town of Marlborough, Ulster County, in 1779 was Adam Baker. In 1788, Adam Baker was in the group responsible for road work from the Plattekill Road as far as the bridge west of Absalom Cases’s. These mentions are in History of Ulster County, New York: With Illustrations and Biographical sketches of its prominent men and pioneers, page 78. The 1790 Census has an Adam Baker in New Marlborough, Ulster County, New York, with a household of 2 males over 16, one being Adam; 1 male under 16, and 9 females. This family could easily include wife Maria and a daughter Hannah. In 1800, the Town of Plattekill was created out of the Town of Marlborough, which are both in the southeast corner of Ulster County. The 1800 Census has Adam Baker, now of Plattekill, with a household of 3 males and 3 females; the oldest male and female in the 45 years and older range, matching ages for Adam and Maria. Some of the daughters would have married and been out of the household. Early censuses do not have the names of household members, just ticks showing gender and age range. So here was a likely Adam Baker, but no way to find a daughter Hannah. So I turned to Ancestry.com again to see what else I could find about an Adam Baker of Ulster County with a wife Maria. Voila! Up came baptisms of several daughters of Adam and Maria Baker at the New Hurley Dutch Reformed Church in Ulster County in the database U.S., Dutch Reformed Church Records in Selected States, 1639-1989. The New Hurley Reformed Church, founded in 1770, is located north of the hamlet of Wallkill, midway between it and Gardiner to the north, in the Town of Plattekill. The right place for our Adam Church. There were twins Rachel and Sarah Baker or Bakker in 1778, Jannetje Backer in 1780, Antje Bakker in 1783 and in Arriantje Bakker 1786. But no Hannah, who sources say was born 4 March 1773 or 4 March 1775, but I believe more likely 4 March 1774. Recognizing that Adam’s surname was recorded as Baker, Bakker and Backer, I did a slightly wider search to see if there were more daughters baptized. Sure enough, there was Annatje Backer , baptized 8 May 1774 at New Hurley, Ulster, New York, parents Adam Backer and Maria Trysyn. (Maria’s maiden name also was recorded with varied spellings). Research shows the Dutch or Low German name Annatje is a diminutive of Anna, and Anna and Hannah are variants, so Annatje is equivalent to Hannah in English.There she was, I believe — Hannah Baker, likely born 4 March 1774, then baptized about 2 months later, a pattern seen with her five known sisters. They were baptized one to two months after birth. So on this Father’s Day 2016, we’ve confirmed the father [and mother] of Hannah Baker, one of my most fascinating female ancestors. Happy Father’s Day indeed! NOTE: Since writing this post, we have learned that Hannah’s sister Rachel married Charles Mackey while sister Antje, who went by Ann or Anna, married Elias Mackey, the two men apparently cousins. After the couples sold land in Plattekill, Ulster County, in the 1805-1806 period, they moved west to Otsego County, New York. I am grateful to Patricia A. Metsch who shared with me her research of the Mackey families of Ulster County and the marriage of the two Baker sisters. NOTE: It is true that Adam and Maria Baker named two daughters with similar names — Annatje,who went by Hannah, and Antje who went by Ann or Anna. While families in that era often reused a given name when a child died, I believe that in this case Annatje and Antje both survived and married. The names are distinctive enough, and each woman used a different Anglicized version of their Dutch name as adults. A similar naming occurred when Hannah’s son Benjamin and his wife Permelia named their first two daughters Hannah Maria and Ann Augusta. The first daughter went by Hannah or Maria, the second by Anna, Annie and Nannie. Hannah Maria was born 21 Sept 1840 while Ann Augusta was born 6 July 1843. They were both baptized at Trinity Chapel, an outreach of Milwaukee’s St. Paul’s Episcopal Church, on 3 May 1846. NOTE: Antje “Anna” Baker and her husband Elias Mackey named their first daughter Hannah Maria Mackey, another naming parallel and remembrance of family members. Map of Ulster County, NY, 1875, from Beers via Wikipedia. 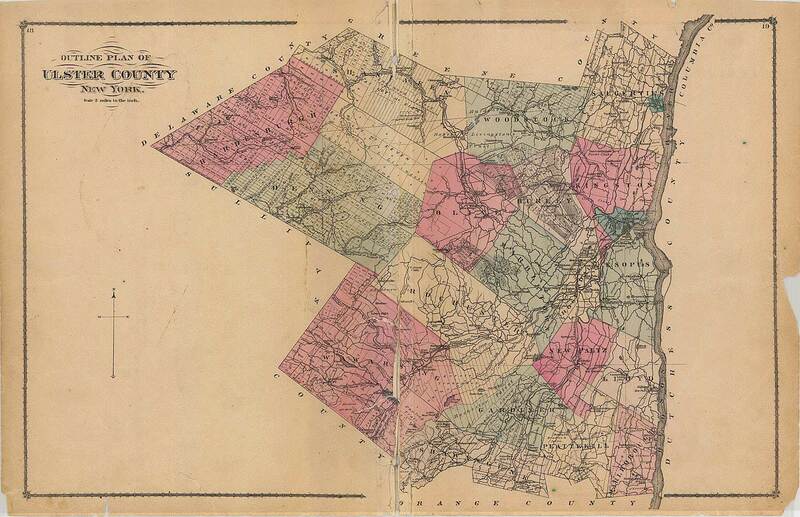 Find towns of New Paltz, Lloyd and Plattekill in the southeast corner. The Society of Friends, or Quakers, played a significant role in the American women’s rights movement and in the campaign for women’s suffrage. This was due, in no small part, to the fact that they supported education for women and had many female ministers or preachers. Among them was my 4th great-grandmother Hannah Baker Church. Hannah was born 4 March 1775, according to Quaker records. Her birth was most likely in Clintondale in the southeast corner of Ulster County, New York. Ulster County borders the Hudson River on its west side, with Dutchess County across the river along its east side. Her parents are thought to be Adam and Maria Baker, also of Ulster County, but that is not confirmed. Still, the household of Adam Baker in the 1790 U.S. Census in New Marlborough, Ulster County, included 9 females. New Marlborough was also in the southeast corner of the county. Hannah married Caleb Church in about 1796 and they had 10 or more children, from John in 1798 to George Washington Church in 1819. Among their sons were Benjamin F. Church, my 3rd great-grandfather, born in 1807, and Samuel Church born in 1805. Samuel’s published biographical sketch provides important details on the Church family and genealogy. On 21 August 1805, Hannah was received by request [rec. by req.] into the Valley Preparative Meeting of Quakers in Plattekill, Ulster County, New York, according to the volume Quaker History and Genealogy of the Marlborough Monthly Meeting, Ulster County, N.Y., 1804-1900. Her “convincement” of Quaker values led to her membership. She would have been 30 years old. The most noted of the early Friends ministers in that area were Dr. Adna Heaton, Hannah Church, Nathaniel Thorn, his daughter Esther Weeks, Sarah Roberts and Sarah E. Roberts, the book states. Hannah was a Quaker preacher “who went around on horseback with Hannah Frye,” according to the book Descendants of Richard Church of Plymouth, Mass. Hannah is credited by several sources with playing a valuable role in establishing a Quaker meeting in Clintondale, Ulster County, and working for construction of a meeting house there. These include the book History of the Village of Clintondale, Ulster County, NY. The First Settlement to 1824, by P.N. Mitchell, and the History of Clintondale Monthly Meeting, online. While her husband Caleb is mentioned as an Orthodox Quaker as is Hannah in son Samuel’s biosketch, Caleb is not listed in the Quaker book cited here. He perhaps was never a full member. The Church family was of Puritan stock, Samuel’s biosketch notes. Beset by a “rheumatic affection” at the end, Hannah died 24 September 1843 in Clintondale, survived by her husband Caleb and many of her children. A remarkable woman. > Quaker History & Genealogy of Marlborough Meeting, Ulster County, N.Y.
> Descendants of Richard Church of Plymouth, Mass. > History of the Village of Clintondale, Ulster County, NY. The First Settlement to 1824, by P.N. Mitchell. > “The Friend,” published by The Friend, 1844, in Volume 17 (1843/1844), page 72. Milwaukee pioneer carpenter and builder Benjamin Church, who arrived there in 1835, was the son of Caleb Church and Hannah Baker Church of Ulster County, New York. Born in 1807, he was one of ten or more children born to Caleb and Hannah between 1798 and 1819. Ulster County is located on west side of the Hudson River, opposite Dutchess County. A vivid if brief picture of Caleb Church (1772-1856) emerges from several books and online resources such as land and probate records. Noteworthy is his brief profile in the book Descendants of Richard Church of Plymouth, Mass. Rutland, Vt.: Tuttle Co., 1913 – in the section for Church families with unproven links to Richard Church. Caleb was a substantial land owner having purchased 100 acres on 8 Dec 1798. Ulster County, New York Deeds, FHL# 944750, states that “Caleb Church of Newmarlborough, Ulster Co, NY, bought for 250 pounds etc land in New Paltz from Newman Waring.” This is consistent with his grandson Oliver B. Church’s biographical sketch that says Caleb bought land, built a log cabin, and raised large family. Neighboring landowners in Ulster County included the Terwilliger, Housbrouck/Hasbrouck, Ellis and Freer families. The book’s entry for him – No. 2542. Caleb Church – and a listing of Caleb and Hannah’s children are online here. Caleb is said to be of English Puritan ancestry, and was born in Dutchess County, New York, where he grew up on a farm, according to his son Samuel’s biographical sketch in the book Commemorative Biographical Record of Ulster County, New York: Containing Biographical Sketches of Prominent and Representative Citizens, and of Many of the Early Settled Families. This book also states that Caleb and his wife were members of the Orthodox Friends Church, and he was a Democrat in politics. See Samuel’s biography online here. Samuel, perhaps with his father’s assistance, went to New York City in 1821, when he was 16, to learn the carpentry and building trades. There is no evidence that his younger brother Benjamin had this training, but if not, he surely learned skills from Samuel before heading west in 1834 to pursue a career as a carpenter and builder. Who were Caleb Church’s ancestors? Mrs. Susannah B. Lefevre (Susannah Brodhead Church LeFevre), Caleb’s great-granddaughter, believed he was descended from Richard Church (lineage Caleb 5 , Nathaniel 4 , Joseph 3 , Joseph 2 , Richard 1) but this is unproven. Her submission was included in Descendants of Richard Church of Plymouth, Mass. in the unproven section. This Richard Church came to America in 1630, became a freeman in Plymouth in 1632, and married Elizabeth Warren, daughter of Richard Warren who came on the Mayflower. More about him online here. There were three Church families in the 1790 Census in Dutchess County, namely Benjamin Church, John Church and Thomas Church. The Church Family section in the book Little Compton Families from Records compiled by Benjamin Franklin Wilbour, Volume I, says there was a Benjamin Church born in 1732, married in 1773 to Johannah Wilbor, daughter of Joseph Wilbor, who went to Nine Partners, Dutchess County, New York. This Benjamin Church was in Dutchess County in 1785 when his father Joseph deeded him land from an Uncle Caleb. According to Descendants of Richard Church of Plymouth, Mass., his father deeded on 18 Dec, 1785, to son Benjamin “of Nine Partners, N. Y., a 15-acre lot left me by my uncle Caleb Church.” The lineage of this Benjamin Church is Joseph 4, Joseph 3 , Joseph 2 , Richard 1. For now, the ancestry of Caleb Church who married Hannah Baker is unknown, but there are theories and possibilities worth pursuing. In the meantime, we enjoy thinking of him up in the garret, his feet on the rafters, preparing for a legal case.